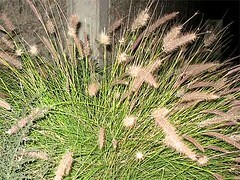 I grabbed some seeds off of this Ornamental Grass planted on the corner of Drumm and Washington in San Francisco. You can see a closeup of the seeds in this link . I don't know what variety this is. Write me if know.